Download "The Case for KPI Online"
Read here to find out about the challenges small businesses face on a daily basis when trying to manage their company with spreadsheets, and what KPI Online offers to help small and mid-size businesses overcome these challenges and become highly successful companies. 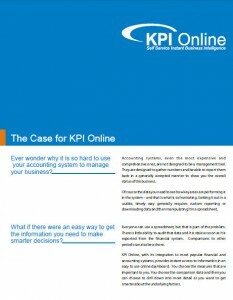 Read here to find out how KPI Online can provide you with instant intelligence and a single version of the truth about your company, and how easy and risk-free it is to use. Read here to find out what ERP or accounting systems we have direct connections to. For everything you wanted to know about KPI Online but were afraid to ask, click here for our FAQ.